Protect your accounts with the flip of a switch. If you happen to misplace your debit or credit card, card control allows you to turn on and off your cards to protect your accounts from unauthorized use. You can also set up spending limits that will automatically turn off your card when you have reached a specified amount. 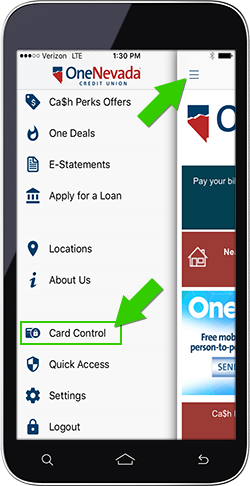 Card control is included with all of One Nevada checking and credit card accounts. Switch Cards On and Off Instantly. Turn your card on and off with a single touch, and the status is changed immediately. With ultimate control comes peace of mind. 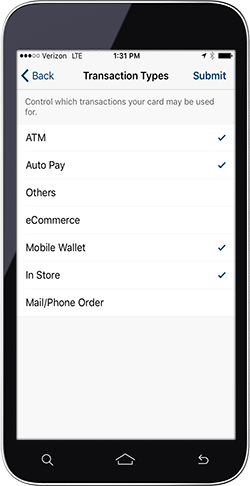 Enable specific categories of merchants, depending on expected card usage. 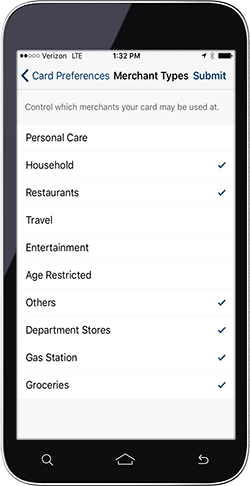 For example, you can enable groceries and fuel for everyday purchases, but disable entertainment and travel until required. 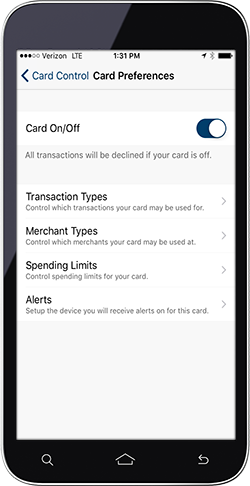 Enable specific types of transactions, depending on expected card usage. For example, if you do not shop online often, you can disable eCommerce but turn it on instantly when required. In the One Nevada mobile app, click the menu button. Then swipe down to select "Card Control". Need help with Card Control settings? Read our Card Control article in the One Nevada Knowledge Base.